I’ve loved Van Gogh since the big Metropolitan Museum of Art show “Van Gogh in Arles” in 1984 and the “Saint-Remy and Auvers” show in 1986, and reading his Dear Theo book of letters to his brother around the same time. Those shows and that book changed my life by showing me first the dedication a serious artist has to his work, and what a body of work could look like, and secondly how it could change a room and a person’s life. Which was also connected to another artist I identified with, Jack Kerouac, who similarly created one vast body of work, that when taken in totality, is knee-buckling in its vastness and awe-inspiring in its beauty. 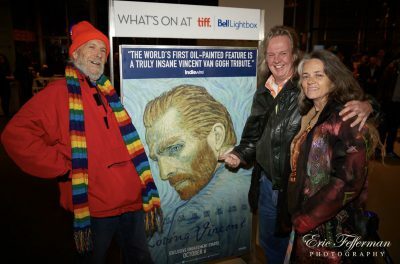 If you haven’t heard, this movie is largely hand-painted with oils in Van Gogh’s style. It’s like the “Red Roses, Green Gold” musical I saw last month in New York with my same two Art Adventure-mates Sky and George Walker in that it takes existing works (songs in that case, paintings in this) and builds a story around them. In Loving Vincent, they’ve tapped into a 2011 Van Gogh biography that explores whether he in fact committed suicide or perhaps it was something else. Whether that book and its conspiracy-theory propheteering nonsense contains a shred of fact is beside the point here — because it makes for a fun dramatic mystery that the narrative of the movie is based around. I also likened this movie to On The Road — the 2012 adaptation of the Kerouac classic. When first seeing that movie, it was fun in that as each new scene would open, you’d realize, “Oh, it’s THAT scene,” and then settle in and enjoy the visual dramatization of some moment you’d only read on a page. Similarly, here we go from one Van Gogh masterpiece to another without any idea of what’s coming next. If you’ve spent any time at all appreciating Van Gogh’s works — particularly his last years in Arles, Saint-Remy and Auvers — you’ll recognize every scene and work — which suddenly come to life. Crows leaping out of corn fields, trains chugging by in the distance, candle lights flickering their illumination, smoke wafting up in the face of colorful storytellers, and faces that were once static coming to life with voices and mannerisms we could only imagine while standing in a museum or flipping pages of an expensive art book. The movie also uses flashbacks to convey the backstory, which are shot in live-action with actors, then run through a filter that makes them look like black-&-white/ sepia Van Goghs from his early “Potato Eaters” phase. [EDIT: see first comment below.] This has the effect of not only telling the story and giving faces to young Vincent and his brother Theo etc. but also gives the viewer a respite from the blazing colors of the moving canvases, not unlike the white walls of a museum give your eyes a rest before you move to the next eye-popping landscape or portrait. 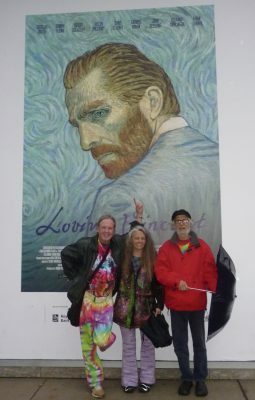 The movie is sadly missing Madame Ginoux (one of whose portraits is on permanent display at the Met) but Dr. Gachet coming to life in brilliant blazing blue with facial expressions in oils to rival the most subtle actor is a cinematic explosion to rival Star Wars — except in Van Gogh’s explosive oils. The fading transitions back & forth from the sepia to the full-color action makes you feel like the acid is just kicking in every time. Suddenly a black & white world is swirling in dizzying colors and people become moving paintings and colors appear where there were no colors before. Artists like to control their work. They have visions and work hard to execute them exactly as they see them. That’s where discipline and practice and trial-&-error come into any effective artist’s work. And painters have the blessing of not having rote copyeditors or album “producers” or ego-maniacal studio heads messing with their work. But once their bodies have stopped ticking and their hands stopped creating … the life’s work is done. I think in 2017, a century after old Vinnie bit it in a wheat field with crows, he would be happy to see the “Loving” repurposing of his work in this way, just as I believe Jerry Garcia would get a kick out of his songs being reenvisioned as a musical, or Jack Kerouac and Neal Cassady would appreciate how George Walker & I are bringing their words to life on a stage. There are those rare artists in history who transcend their medium and their era to become something that is the world’s, that is bigger and even more transcendent than the works they first created. If you can create a painting that can become a movie, or songs that can tell a grand unified story, or create characters on a page that can become alive on a stage, you have left the world a rich fluid palette more valuable than any single “masterpiece.” Few artists create such lasting multi-medium works, but we are lucky to be living through a time when innovation and reflection allow us to experience some of the greatest works of the past in entirely new ways while still truly reflecting the original vision. I like to think of Vincent, Jerry and Jack sitting back and rejoicing in a corner booth at a cafe/bar in heaven, looking from on high as us mortals still dab their wet palettes, still expand the songs they left behind, still bring their characters to life. I think that’s what any artist wants to bestow to this world. Not just what they got finished before they checked out, but to know that all their hard work with accompanying depressions and addictions and rejections actually produced the inspiration for others to build upon their constructions. Creating great somethings out of vast nothings is hard enough to generate appreciation in others. But when your work can become new work, you have become a Great Creator, a God, a deity of art, turned water into wine, paint into people, air into emotions, and hard work into eternity. Here’s the official trailer . . .
Or here’s sumore . . .
Here’s a clip from it as an example . . .
And here’s a bunch of other movie reviews. And here’s a fun storytelling Vincent poem. And here’s my new book on art forms crossing generations — How The Beats Begat The Pranksters. I was lucky enough to be able to view this motion painting twice the second time on a recommended dosage and it is the most spectacular movie created I loved every frame of it and appreciated each artist’s take on Vincent’s style, I loved every moment of this beautiful piece of art. It is a must see. I went last Tuesday to the Norfolk, VA, premiere with Kilometers’ little sister and another friend. Excellent! Thanks for clueing me in. Thanks for the review Brian. This film seems to be on a whole other level – much like the artist and his work. Nice review (and interesting comparison to the 2012 On the Road movie which I haven’t seen, but read about in “How the Beats Begat the Pranksters”). Really dug seeing this film in a small, 30-some seat “art house” – a relatively new addition to York. Excellent film that I probably would’ve missed had I not seen your Toronto fb post… thanks! Van Gogh’s Sunflowers is still one of my all-time fav paintings (I got to see it at the Philadelphia Museum of Art), and it was wonderful seeing Vincent’s paintings come to life over an interesting storyline and dialogue. Pretty much the quintessential romantic tale of the tortured artist, though I still like to think he didn’t commit suicide (which the film certainly calls into question). Right on, Bob. So glad you experienced it! Yeah — I wish they’d gone to all this work with the story of when he first came to Arles/San Remy and climactically peaked in his vision and execution — THAT was the moment in Vincent’s life. One of the most STUNNING movies I’ve ever seen … and seeing it in Paris to boot!